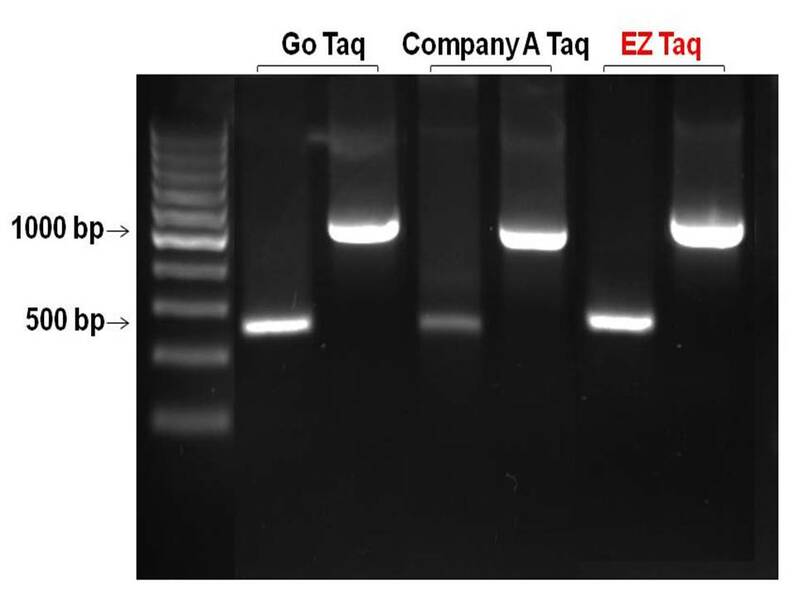 EZ Taq DNA Polymerase is a thermostable recombinant DNA polymerase derived from thermophilic bacterium Thermus aqualicus. EZ Taq DNA Polymerase can amplify DNA target up to 5 kb. The Taq DNA Polymerase has 5 to 3 polymerase activity but lacks of 3 to 5 exonuclease activity that results in a 3-dA overhangs PCR products. The elongation velocity of the polymerase is 0.9-1.2 kb/min. The EZ Taq DNA Polymerase can be used for routine PCR cloning, DNA labeling and DNA sequencing. EZ Taq DNA Polymerase is supplied with either 5X Colorless or 5X Red Reaction Buffer. Reliable amplification with EZ Taq DNA Polymerase. 500 bp and 1000 bp plasmid DNA fragments were amplified with Taq DNA Polymerase from different brands.